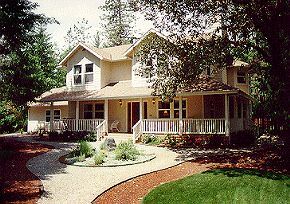 A distinctive country retreat on 9 acres of secluded meadow and woods near the Rogue River. Enjoy whitewater rafting, California Redwoods, Crater Lake, the Shakespeare Festival, Historic Jacksonville. If you come just to relax and renew, our country roads are ideal for long walks, jogging or biking. Our bed and breakfast is styled after Midwestern farmhouses, with a wraparound porch with wicker furniture, a sitting room with fireplace, and a dining room with windows to capture the morning sun. French doors open to the English cutting and herb gardens, a deck with hot tub under towering pines, and a Koi pond in a forest setting. Upstairs are four large bedrooms, each with full private bath, queen pillow-top mattress, window seat and/or sitting area. Air conditioned. Healthy breakfast with seasonal fruits and vegetables from our garden. Children over 12. No smoking or pets. Visa, MC, AMEX, or Check. Deposit: First night's stay. Rates: $95 - $130. Closed Nov-Jan. This and other Grants Pass Oregon Bed and Breakfast Inns can be found here in The Register.